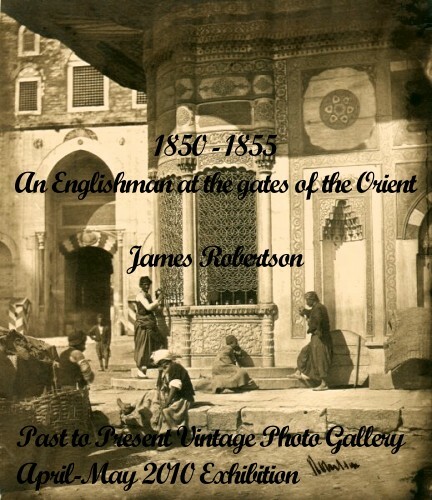 Our April-May 2010 exhibition showcases a large group of salt prints by english photographer James Robertson. The photographs were found in an album apparently put together by a French Army or Navy officer who served in Turkey and later in Crimea, Indochina and China. We believe the photographs in the album are early examples of Robertson's work from 1853 or 1854 before his association with Beato. None of the signed prints have the double signature Robertson & Beato and one of the prints shows a tent near a fountain which we haven't seen in other similar photographs. The album also included 3 drawings, one of which is dated July 1854. The first page of the exhibition gives a short biography of Robertson in french, english and turkish and a bibliography is available below. Scanning salt prints proved difficult and the results vary but we tried to describe the condition and contrast as well as possible when the scans are very different from the actual prints. The subjects we plan to showcase next are anonymous snapshots, World War II Japanese propaganda photos and preWWI aviation.